There are several buildings on Park Manor Road. I think this is the “south” one. It was the strongest wooden door I saw on my walking tour. I spent a couple of days this week on the campus of Babson College while attending an IT Security Workshop being held at the Babson Executive Education Center. I hope they don’t mind if I abbreviate the BECC because that’s a mouthful keyboardful. If you’re thinking, “wow, Dan is so organized, he knew he was going to be at Babson and planned a Doors post around that” you – would – be – wrong. Generous, but wrong. The truth is, Dan forgot that the pictures of the door Dan wanted to feature this week, are on his personal laptop. Dan is carrying his work laptop. Dan is confused. My editor might add: “Dan is easily confused” so I’ll put that in for her. As I am starting this, I don’t actually have any pictures of Babson doors. I am hoping that the rain will stop by tomorrow so I can walk around campus and snag a few pictures. I hope the clouds are gone and the sun is up too. I did get some pictures, but they aren’t what I was hoping to find. It turns out, Babson isn’t one of the 60 or so stately old campuses that form the country’s most prestigious area of higher learning. I hope that’s appropriate homage to my Boston friends. As it turns out, Babson College isn’t even 100 years old. It was founded in 1919 in the former home of Roger and Grace Babson. Academically, Babson has always been focused on Business Administration. Although I wasn’t interested in Business Administration until I went to graduate school, I do like a couple of things that I read about Roger Babson. Of course, my grades and financial situation would have also kept me out of Babson at any point in my academic career but that’s not the story today either. The story is that I spent a day and a half talking about and listening to others talk about information security and I did learn a lot. The notion that “experience is the best teacher” is alive and well. I guess they picked a good place for this workshop. This door was a contender, but another of the bland door – interesting transom variety. This is a full shot of the building with today’s featured door. It’s an interesting building, but I can usually depend on a chapel to have a cool door. Not here, glass and metal. This used to be the largest rotating globe in the world. It fell into disrepair and was going to be torn down. Students mounted a campaign to save it. It was rebuilt but no longer rotates. Close-up of the Babson Globe. This building looked promising in my search for a cool door. The door is nie looking, but it’s stamped steel. Like on many of the doors here, I do like the transom. This building was the closest to the BECC. It’s a nice door and Icame close to featuring it today. This post is part of Norm Frampton’s Thursday Doors series. You can find a link tool on Norm’s post and join us on any given Thursday. Thanks Judy. After this workshop.I was ready to go home, cut all the cables and toss my iPhone in the disposal. I might give some thought to doing such a post. It really is scary, but there are lots of things you can do. Nice place to learn a few new tricks, Dan, but I want to know if you can say “mouthful keyboardful” three times fast. I can’t Mary, the ‘B’ and the ‘V’ keep getting stuck in my teeth. I was trying to think of a simple way to say “it’s too much to type!” I did learn a few things though, so that was good. Thanks for dropping by. That’s perfect! I should have known there would be an answer out there. You still found a few nice ones Dan. I really like the trim and moldings on that all-white one. Thanks Norm. 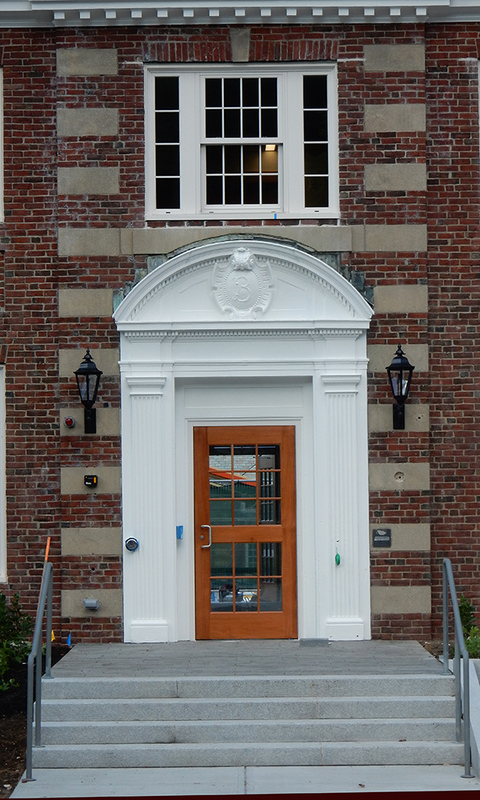 The trim and molding was beautiful on a lot of doorways where the door was a metal/glass or stamped steel door. I wish they had put a bit more energy into the doors. In any case, it was a fun walk and it was the only time I had been outside in over 24 hours. Beautiful building, love the globe and the chapel too. Thanks – the Chapel was beautiful. Given the fact that is has to serve multiple religions, I wasn’t expecting church-like doors, but I was disappointed with the all glass deal. Still, the front of the building was beautiful. The lighting was terrible so my picture suffered by me not knowing how to compensate with camera settings. Nice topic-choice for one of your Thursday Doors, Dan. It looks like a charming campus. Like that globe. Have a thriving Thursday. Thanks Teagan. When I realized that I had a blog post written but that I hadn’t uploaded the photos, I needed a Plan-B – this was a nice way to spend an hour. When I was in college, business majors had to dress professionally for x amount for the last of their course work, and of course teachers did, too, intermittently, dependent on the profs and the classroom time. There was one teacher-teacher none of us girls wanted to get, because she insisted on dresses and skirts every single day, and Muncie winters made us want to wear trousers — Oh how the wind rips across flat land! We all wanted the guy who wore jeans and Birks and didn’t care what we wore! Thanks. Chemistry was always a jeans and tee shirt thing, and you didn’t even want to wear good jeans to lab. It will probably show up in a future blog post, but when I was dating my wife I told her “you women are lucky because you get to wear stockings” – I honestly thought stockings had some miracle insulating power against winter winds and cold temps. I bought her a full-length down coat for Christmas that winter (after she set me straight). Thanks Amy. The globe had such an interesting story that I think it could be its own blog post. I was glad that such a business-oriented school was prodded into saving that from the dumpster. I’m always glad when my readers smile. That globe jumped out at me right away! I am really happy for that school that someone thought to save it. In my opinion, it is fascinating. I did the suit and tie thing for many years at work, but I fully embraced “business casual” and I love “jeans day.” But, it’s different if someone is paying me or I am paying them. To be paying them AND have to wear a suit and tie? No, not gonna happen. You’ve made this a truly interesting and worthwhile post. Thanks John. I like this series Norm started because it forces me to plan a little more than I normally do. This was a bit of a scramble, but I was lucky to be in a good place to do that. Nice save on your door challenge 😉 i’m always game for shots from any campus, and no matter what doors leading to education look like ohysically, they are some of our most cherished. Besides, these were beautiful doors ! Thanks Sammy. It is a beautiful campus. I went to school, mainly on two urban campuses, that only had tiny quads that looked anything like this. I enjoyed the time I spent walking around, especially since I had been cooped up inside for over 24 hours before this. thanks for sharing much more then a door. I love the photos and that one witht he globe, I had to do a double-take. Thanks Evelyn. I had to do a double take on the globe too and I liked it for that reason. Hmm, normally I wouldn’t advocate painting a nice wooden door, but you know, I’d like to see your featured door in black, Dan! Wonderful set of photos. Even the “bland” does are interesting! Thanks. The trim and the transom windows add a very distinct look to some of the bland ones. Sorry Dan, my ‘smilies’ don’t turn out either, lol. Hmm. A couple things jump out at me from this post, Dan. Not the doors — sorry, they’re fine, but you’ve kind of raised the bar with past entries! One is the Roger Babson quote. Partly, of course, because it’s true, but also because I had a boss for years that would say that (a variation, actually, along the lines of “just as there are no permanent defeats, there are no permanent victories”). I find it comforting, at least when things go wrong, and inspirational when things go right (that we need to work to maintain things). The other is how students were “required to wear professional attire.” I hate how people tend to dress like slobs nowadays. Sure, I like to shed a tie as much as the next guy, but we’ve gone too far the other way. On campuses across the country, you have stately doors that were built when people cared about their appearance being used by students who spend their days dressed like they just came from the gym. Quite a dissonance! I actually have photos of three quotes Paul but that one stuck me as being the best. You’re right, it is comforting when things go wrong and it’s helpful because wrong isn’t always permanent even in the moment. I’ve made plenty of mistakes in woodworking that I’ve managed to turn into an improvement over the plan. That’s actually one of the posts on my previous blog that I’ve tagged to move over here at some point. You can’t let failure stop you. As for dress, I think I emphasize the casual part of business casual, but I always try to look good. Sometimes that means a denim shirt over my Pirates shirt, but I don’t want to look like a slob. I think the place where this has changed the most is with air travel. I’m old enough to remember getting a little dressed up for a flight. Now, I see people on planes and I wonder if they didn’t just roll out of bed and drive to the airport. Thanks as always for your support here. 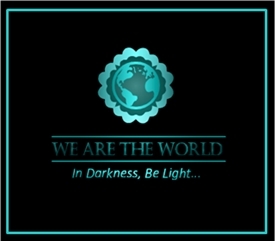 Great post and I love the pictures you’ve posted. 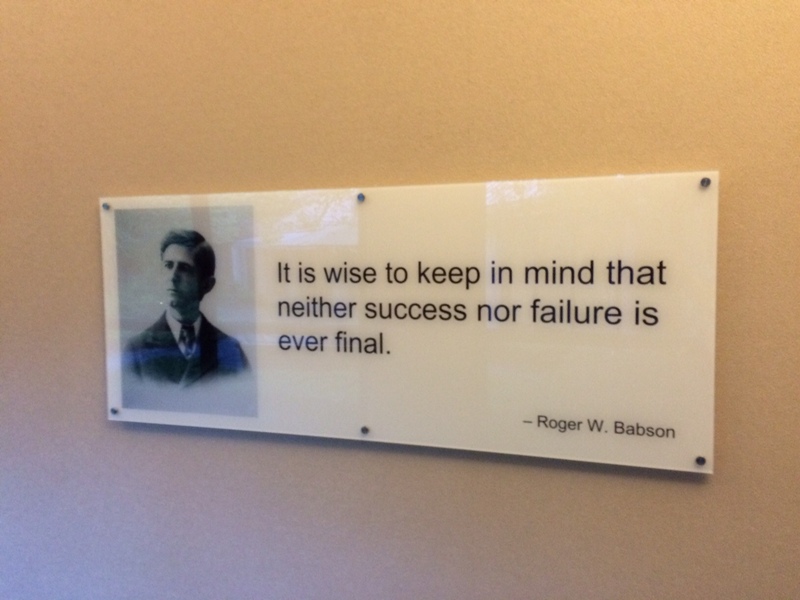 Especially the quote by Roger Babson and the Babson Globe. Thanks! There were several quotes hanging in hallways but I like that one the best. Talking about quotes I recently saw this biographical movie of Manjhi. Where this guy chisels the mountain single handedly. So at the end a journalist asks him Sir, what made you do it? He replies “Love”. The journalist asks another question, “so you didn’t had any faith in God?” He replies, “No”. Journalist asks ” why?” He says “Never wait for God to act, what if God is waiting for you to act first”. I really do appreciate her help, on these posts and in so many other ways. I try not to abuse that. I thought about asking her to start up my other laptop and send me the photos I needed, but it’s blog post about a door, it’s not something that’s about to fall out of orbit. Thanks for noticing my helpmate’s impact. Let’s see : You forgot your door , couldn’t get shots of another door because of rain , yet manage to post a slew of interesting doors anyway …………I’ll have to re-read this one .